Paikar is 45 years old and she lives in Kabul. 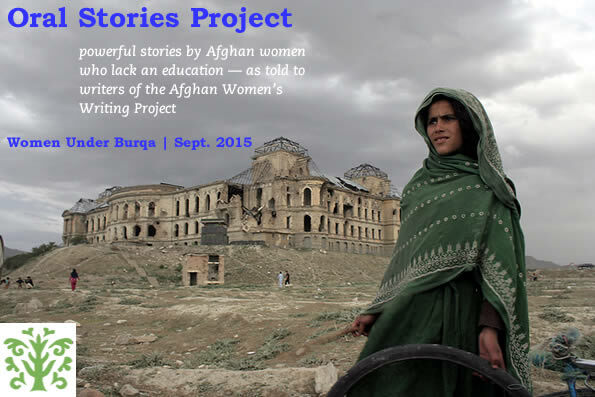 Kabul– I have heard a lot about women’s rights. But we women cannot go alone outside the house or help our husbands with the work outside the house to become breadwinners to help our families. I am not literate. My father prevented us from going to school. At that time the government was not as free and liberal as it is now. It was very ignorant and conservative and did nothing about helping to convince fathers to let their girls become educated. Now when I go outside the house I don’t know where to go. I can’t even read what is written on big billboards across the city. I am like a blind person and I don’t know much about women’s and girl’s rights so I cannot teach it to my daughters. I used to wear the burqa. But now I wear a black covering in Kabul. Even in Kabul, we cannot live a peaceful life because Afghanistan is full of Taliban and ISIS and they do not allow people to live a happy life. They do not even allow people to eat what they want. Our president does not implement specific policies for our rights. I cannot go alone to a doctor because my husband does not let me. The Taliban and ISIS had a great influence on him and so he implements the Taliban’s rules in our house. Women mostly work at home and do house chores. There is no rule against women working, but even our husbands cannot have proper jobs, not to mention the women. When we were young, we did not have the choice to choose our own husbands. But now I see that many girls have the right to do so and that it is their right according to Islam. My request of the government is to allow our children to become knowledgeable and study.